VC | Feed: "Overexpression of cellular telomerase RNA enhances virus-induced cancer formation"
"Overexpression of cellular telomerase RNA enhances virus-induced cancer formation"
Blackburn EH. Telomere states and cell fates. Nature. 2000;408:53–6. Collins K. Physiological assembly and activity of human telomerase complexes. Mech Ageing Dev. 2008;129:91–8. Autexier C, Lue NF. The structure and function of telomerase reverse transcriptase. Annu Rev Biochem. 2006;75:493–517. Kim NW, Piatyszek MA, Prowse KR, Harley CB, West MD, Ho PL, et al. Specific association of human telomerase activity with immortal cells and cancer. Science. 1994;266:2011–5. Martin-Rivera L, Blasco MA. 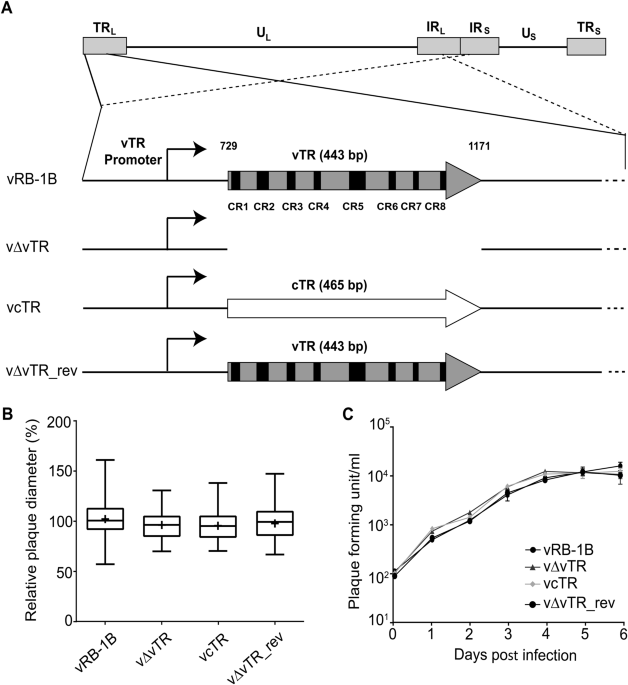 Identification of functional domains and dominant negative mutations in vertebrate telomerase RNA using an in vivo reconstitution system. J Biol Chem. 2001;276:5856–65. Chen JL, Blasco MA, Greider CW. Secondary structure of vertebrate telomerase RNA. Cell. 2000;100:503–14. Cao Y, Bryan TM, Reddel RR. Increased copy number of the TERT and TERC telomerase subunit genes in cancer cells. Cancer Sci. 2008;99:1092–9. Baena-Del Valle JA, Zheng Q, Esopi DM, Rubenstein M, Hubbard GK, Moncaliano MC, et al. MYC drives overexpression of telomerase RNA (hTR/TERC) in prostate cancer. J Pathol. 2018;244:11–24. Penzo M, Ludovini V, Trere D, Siggillino A, Vannucci J, Bellezza G, et al. Dyskerin and TERC expression may condition survival in lung cancer patients. Oncotarget. 2015;6:21755–60. Li L, Jiang W, Zeng SY, Li L. Prospective study of hTERC gene detection by fluorescence in situ hybridization (FISH) in cervical intraepithelial neoplasia 1 natural prognosis. Eur J Gynaecol Oncol. 2014;35:289–91. Nowak T, Januszkiewicz D, Zawada M, Pernak M, Lewandowski K, Rembowska J, et al. Amplification of hTERT and hTERC genes in leukemic cells with high expression and activity of telomerase. Oncol Rep. 2006;16:301–5. Gazzaniga FS, Blackburn EH. An antiapoptotic role for telomerase RNA in human immune cells independent of telomere integrity or telomerase enzymatic activity. Blood. 2014;124:3675–84. Rumin Wen JL, Li Wang, Yang Wenfa, Mao Lijun, Zheng Junnian. Attenuation of telomerase activity by siRNA targeted telomerase RNA leads to apoptosis and inhibition of proliferation in human renal carcinoma cells. Chinese. J Clin Oncol. 2006;3:326–31. Osterrieder N, Kamil JP, Schumacher D, Tischer BK, Trapp S. Marek's disease virus: from miasma to model. Nat Rev Microbiol. 2006;4:283–94. Trapp S, Parcells MS, Kamil JP, Schumacher D, Tischer BK, Kumar PM, et al. A virus-encoded telomerase RNA promotes malignant T cell lymphomagenesis. J Exp Med. 2006;203:1307–17. Fragnet L, Blasco MA, Klapper W, Rasschaert D. The RNA subunit of telomerase is encoded by Marek's disease virus. J Virol. 2003;77:5985–96. Fragnet L, Kut E, Rasschaert D. Comparative functional study of the viral telomerase RNA based on natural mutations. J Biol Chem. 2005;280:23502–15. Shkreli M, Dambrine G, Soubieux D, Kut E, Rasschaert D. Involvement of the oncoprotein c-Myc in viral telomerase RNA gene regulation during Marek's disease virus-induced lymphomagenesis. J Virol. 2007;81:4848–57. Chbab N, Egerer A, Veiga I, Jarosinski KW, Osterrieder N. Viral control of vTR expression is critical for efficient formation and dissemination of lymphoma induced by Marek's disease virus (MDV). Vet Res. 2010;41:56. Mason M, Schuller A, Skordalakes E. Telomerase structure function. Curr Opin Struct Biol. 2011;21:92–100. Wyatt HDM, West SC, Beattie TL. InTERTpreting telomerase structure and function. Nucleic Acids Res. 2010;38:5609–22. Kaufer BB, Trapp S, Jarosinski KW, Osterrieder N. Herpesvirus telomerase RNA(vTR)-dependent lymphoma formation does not require interaction of vTR with telomerase reverse transcriptase (TERT). PLoS Pathog. 2010;6:e1001073. Kheimar A, Kaufer BB. Epstein-Barr virus-encoded RNAs (EBERs) complement the loss of Herpesvirus telomerase RNA (vTR) in virus-induced tumor formation. Sci Rep. 2018;8:209. Akıncılar SC, Low KC, Liu CY, Yan TD, Oji A, Ikawa M, et al. Quantitative assessment of telomerase components in cancer cell lines. FEBS Lett. 2015;589:974–84. Koh CM, Khattar E, Leow SC, Liu CY, Muller J, Ang WX, et al. Telomerase regulates MYC-driven oncogenesis independent of its reverse transcriptase activity. J Clin Invest. 2015;125:2109–22. Khattar E, Kumar P, Liu CY, Akincilar SC, Raju A, Lakshmanan M, et al. Telomerase reverse transcriptase promotes cancer cell proliferation by augmenting tRNA expression. J Clin Invest. 2016;126:4045–60. Murre C. Ribosomal proteins and the control of alphabeta T lineage development. Immunity. 2007;26:751–2. Anderson SJ, Lauritsen JP, Hartman MG, Foushee AM, Lefebvre JM, Shinton SA, et al. Ablation of ribosomal protein L22 selectively impairs alphabeta T cell development by activation of a p53-dependent checkpoint. Immunity. 2007;26:759–72. Rao S, Cai KQ, Stadanlick JE, Greenberg-Kushnir N, Solanki-Patel N, Lee SY, et al. Ribosomal protein Rpl22 controls the dissemination of T-cell lymphoma. Cancer Res. 2016;76:3387–96. Rao S, Lee SY, Gutierrez A, Perrigoue J, Thapa RJ, Tu Z, et al. Inactivation of ribosomal protein L22 promotes transformation by induction of the stemness factor, Lin28B. Blood. 2012;120:3764–73. Le S, Sternglanz R, Greider CW. Identification of two RNA-binding proteins associated with human telomerase RNA. Mol Biol Cell. 2000;11:999–1010. Ghosh A, Saginc G, Leow SC, Khattar E, Shin EM, Yan TD, et al. Telomerase directly regulates NF-kappaB-dependent transcription. Nat Cell Biol. 2012;14:1270–81. Tischer BK, Smith GA, Osterrieder N. En passant mutagenesis: a two step markerless red recombination system. Methods Mol Biol. 2010;634:421–30. Engel AT, Selvaraj RK, Kamil JP, Osterrieder N, Kaufer BB. Marek's disease viral interleukin-8 (vIL-8)promotes lymphoma formation through targeted recruitment of B-cells and CD4+ CD25+ T-cells. J Virol.2012;86:8536–8545. Tischer BK, Kaufer BB. Viral bacterial artificial chromosomes: generation, mutagenesis, and removal of mini-F sequences. J Biomed Biotechnol. 2012;2012:472537. Tischer BK, von Einem J, Kaufer B, Osterrieder N. Two-step red-mediated recombination for versatile high-efficiency markerless DNA manipulation in Escherichia coli. Biotechniques. 2006;40:191–7. Jarosinski KW, Margulis NG, Kamil JP, Spatz SJ, Nair VK, Osterrieder N. Horizontal transmission of Marek's disease virus requires US2, the UL13 protein kinase, and gC. J Virol. 2007;81:10575–87. Schumacher D, Tischer BK, Trapp S, Osterrieder N. The protein encoded by the US3 orthologue of Marek's disease virus is required for efficient de-envelopment of perinuclear virions and involved in actin stress fiber breakdown. J Virol. 2005;79:3987–97. Jarosinski K, Kattenhorn L, Kaufer B, Ploegh H, Osterrieder N. A herpesvirus ubiquitin-specific protease is critical for efficient T cell lymphoma formation. Proc Natl Acad Sci USA. 2007;104:20025–30. Jarosinski KW, Osterrieder N, Nair VK, Schat KA. Attenuation of Marek's disease virus by deletion of open reading frame RLORF4 but not RLORF5a. J Virol. 2005;79:11647–59. Kaufer BB, Jarosinski KW, Osterrieder N. Herpesvirus telomeric repeats facilitate genomic integration into host telomeres and mobilization of viral DNA during reactivation. J Exp Med. 2011;208:605–15.